Are you looking for an accommodation in Tuscany where you may spend a relaxing holiday among the amazing Tuscan countryside without giving up a refreshing bath during the hot Summer days? Here you may find a quality selection of farmhouses, villas, holiday homes and hotel with swimming pool: you just need to choose the kind of lodging you prefer and...let yourselves be conquered by Tuscany and its amazing surprises! An ancient castle sitting on the gentle hills of Chianti, finely restored and turned into a beautiful luxury villa perfect for 12 people. It offers a private, gorgeous outdoor pool and exclusive services to make your stay unforgettable. The picturesque setting of these vacation apartments promise stunning scenery, sunsets, outdoor picnics and afternoons by the pool. Great base for your vacation: visit Chianti, Siena, Volterra and Florence. Cozy & comfortable, the large vacation villa at San Fabiano can host up to 21 guests and features the best of Tuscany all in one place! 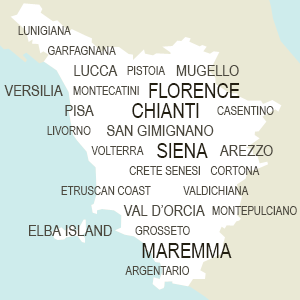 The villa is just 20 minutes south of Siena. The B&B is surrounded by the Mugello countryside, just 35 km from Florence. With just four bedrooms, beautiful garden and pool, it is perfect for those seeking a peaceful vacation destination. Florence and other main sights are reached by car. Independent apartment with swimming pool settled in the countryside near Siena, completely furnished according to the typical rural Tuscan style, with magnificent view on the city of San Gimignano. Charming villa with private pool, garden and BBQ area in the enchanting landscape of the Crete Senesi near Siena. It offers 4 bedrooms and 3 bathrooms located on two floors overlooking the marvelous Tuscan countryside. A B&B only in mid & low season. Charming farmhouse with pool situated in the Chianti area near Florence. It offers rooms and independent apartments, all recently restored and finely decorated and a huge, wide park surrounded by hectars of olive trees and vineyards. Recently restored agriturismo offering rooms and apartments surrounded by a fabolous landscape in Montespertoli, in the heart of Chianti a few steps from Florence. Delicious local food, DOC wines and panoramic pool overlooking the rolling Chianti hills. A privately owned medieval village surrounded by woods in southern Tuscany has been restructured to offer both apartments and villas for families and small groups of friends searching for a unique vacation in Tuscany's countryside. Il Defizio offers a genuine Tuscan experience with B&B rooms, self catering apartments and independent vacation rentals. Located in central Tuscany there are many comforts: a panoramic terrace, air conditioned rooms and on site restaurant for guests. Immersed in the green hills of Chianti, this beautiful farmhouse offers spacious apartments equipped with all amenities. Guests can enjoy a beautiful pool, play area and guided tasting of the farm's excellent wines. Two large Tuscan styled rental apartments located in the northern most corner of Tuscany promises a green and comfortable vacation setting for families and large groups. Close to nature, historic sites and sandy beaches, the farmhouse is a perfect base. The B&B bedroom suites in San Gimignano are romantic and colorful with a beautiful backdrop of history and culture. A delicious breakfast, refreshing pool and free parking are fantastic extras for holiday relax. A private family villa in the hills of Tuscany overlooking medieval towns, sandy beaches & easy access to the Pisa airport. Located within walking distance of shops & restaurants the holiday rentals & private pool are a vacation dream. Getting inspired by Tuscan art, culture and landscape is not difficult at all! Usually referred to as cradle of art, Tuscany is an amazing region to discover, where anyone can meet his match! A varied nature, which ranges from sea to mountains, beautiful cities of art, where past still lives through present and world renowned wine and cooking traditions, which Tuscany is sometimes best appreciated for. If you’re planning a holiday in Tuscany, then a rural accommodation is probably what best suits your expectations: browse our wide and quality selection of villa, holiday houses, B&B and farmhouses with swimming pool, you’ll certainly find what you’re looking for! You’ll be surrounded by countryside, in a perfect location for discovering nature and being a few steps from the most popular art destinations in Tuscany. Let’s make an example: a holiday in agriturismo in Chianti area means discovering all the Chianti region, where the famous wine is produced and the hilly landscape offers an incomparable view on nature, but also being a few kilometers far from Siena and Florence, two of the most important Tuscan cities of art you can’t miss of! Have a look at our accommodation with swimming pool proposals and book your holiday in Tuscany with the owner directly: you’lle certainly experience a trip you won’t forget!